Western blot analysis of extracts from various cell lines using Ape1 (E5Y2C) Rabbit mAb (upper) or β-Actin (D6A8) Rabbit mAb #8457 (lower). Lane 7 contains lysate from 293T cells with Ape1 knockout. 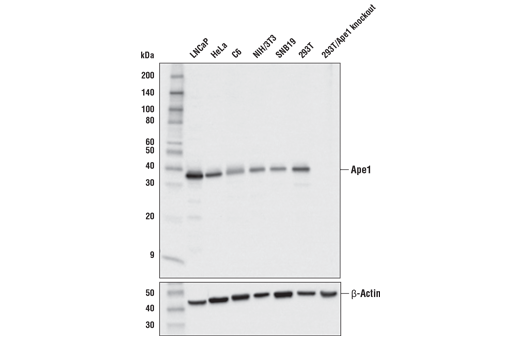 Ape1 (E5Y2C) Rabbit mAb recognizes endogenous levels of total Ape1 protein. Monoclonal antibody is produced by immunizing animals with a synthetic peptide corresponding to residues surrounding Pro223 of human Ape1 protein. Ape1 (Apurinic/Apyrimidic eEndonuclease 1), also known as Ref1 (Redox effector factor 1), is a multifunctional protein with several biological activities. These include roles in DNA repair and in the cellular response to oxidative stress. Ape1 initiates the repair of abasic sites and is essential for the base excision repair (BER) pathway (1). Repair activities of Ape1 are stimulated by interaction with XRCC1 (2), another essential protein in BER. Ape1 functions as a redox factor that maintains transcription factors in an active, reduced state but can also function in a redox-independent manner as a transcriptional cofactor to control different cellular fates such as apoptosis, proliferation and differentiation (3). Increased expression of Ape1 is associated with many types of cancers including cervical, ovarian, prostate, rhabdomyosarcomas and germ cell tumors (4). Ape1 has been shown to stimulate DNA binding of several transcription factors known to be involved in tumor progression such as Fos, Jun, NF-κB, PAX, HIF-1, HLF and p53 (4). Mutation of the Ape1 gene has also been associated with amyotrophic lateral sclerosis (ALS) (5,6). Demple, B. and Sung, J.S. (2005) DNA Repair (Amst) 4, 1442-9. Vidal, A.E. et al. (2001) EMBO J 20, 6530-9. Tell, G. et al. Antioxid Redox Signal 7, 367-84. Evans, A.R. et al. (2000) Mutat Res 461, 83-108. Olkowski, Z.L. (1998) Neuroreport 9, 239-42. Hayward, C. et al. (1999) Neurology 52, 1899-901.